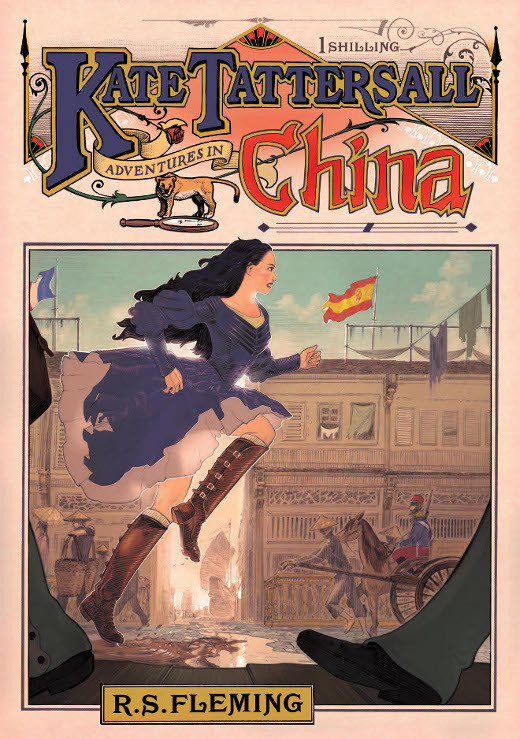 If you’ve selected Kate Tattersall Adventures in China for a book report I’m flattered, thank you very much. I hope this article will help, and you find the mid 1800s a very interesting era to study. The adventure is over 41,000 words, so it should be long enough to meet most teacher’s requirements. (Young adult novels are usually between 30,000 and 60,000 words, but with lots of exceptions.) Most novels are written in a third person omniscient point of view, where the author knows all, and lets you follow different characters throughout the tale, revealing much, including background and thoughts. Another common mode is first person, which reads rather like a person’s memoirs as they recall experiences, usually as the individual looks back with all the answers, knowledge, and wisdom of age. Kate’s adventures are written in the somewhat rarer style of third person limited, which follows a focal character, so the reader is only aware of what Kate knows as events unfold, learns from her experiences, and views the adventures through her eyes. You will have to interpret happenings and interactions with other characters for yourself, determine if Kate acts wisely, and decide if she triumphs or fails. There is background, but limited to Kate’s memories and knowledge. While her thoughts will be clear, appearing throughout the story in italics, what everyone else might be thinking will remain a mystery. As in your daily life, you may only know other people so well, and you only know what is going on in view, perhaps guessing at what you hear. Depending on the nature of the report, you may have to provide information about certain aspects you found particularly interesting. As made clear in the disclaimer, nothing recorded on this website should be used for historical reference without corroborating evidence; I do not footnote or provide a bibliography. However, the passages quoted in the articles are genuine, and everything about life during the mid 1800′s comes from reliable public domain sources. If words appear in the adventure that you aren’t familiar with, try the Glossary for an explanation. You can use the advanced book search provided by Google Books which is excellent, just be certain to enter an appropriate date range and check the title page of each result for accuracy. Wikipedia may not be the most reliable source for some subjects, but the historical articles usually have references for you to continue your research. What follows is a guideline to some of my articles as they apply to the chapters of Kate’s first adventure. There are several other articles to read, with more on clothing, weapons, duelling, &c. If you have a question, or if there is anything pertaining to the mid 1800s you would like to read an article about, please send me a note through the contact page and I will do my best to provide some information. To view lots of images visit Kate on Pinterest, and like us on Facebook for news updates. Great article! I don’t have any book reports coming up, but I did learn quite a bit about “coming out” and the early Victorian make-up. Even though I use light make-up from time to time, I could never imagine putting belladonna nightshade in my eyes, or apply toxic chemicals such as lead around my eyes! This is helpful. I’m going to use this book for school. Thanks.